Since I returned to Haines, it has rained. None of the drizzle stuff, this is the drenching rains where there’s no turning back….no matter how you try to skirt around it. Well… July is raining season around here, so you just deal with it. Interesting enough, fog has been added to the mix – a taste of Fall? Not going there. But oh do I love the sound of the fog horns, the symphony of horns out on the water. Each ship is a different pitch. Add a hot cup of tea, curled up with my cats and a book. Quite content, thank you very much. Soggy nature of things brings to a complete halt my task at hand. I wanted to hire some kids to pull the contents of my storage unit out and then reverse it. Why? So I could finally access the back of my storage. Not going to happen. So canceled the kids. They were raising money for their senior trip next May. So still wanting to help out, I offered up my rig to be washed and waxed. Got to stop raining for that to happen. Recently… I went to put some acquired stuff into storage, I was not a happy camper by any stretch of one’s imagination. On my Mother’s wheelchair and her walker and a few of my boxes was mold. There was no mold the first year, so why now? I don’t know, but pulling stuff out is not a viable solution at this time. Need to go back on a sunny day and look at the situation better. So I’ve been busy, the initial days back in Haines, I was parked at Ft. Seward in a campground called Chilcoot Campground. It is the cheapest place in town at $25 per night for water and electric. There is no dump, no trash barrels, no internet – extremely slow with Millenicom, wi-fi only if you get up early enough… up late doesn’t help. And this is really a tent city nestled into the roots of all the trees. Its so dark under the canopy, no picture can be taken in broad daylight. I parked out on the edge, but had to wait a day, as the hookup sites were full of tenters. Think there are 7 sites with hookups and two of those sites did not work. Not really complaining here, as my site was level and I was close enough to the bay to hear the fog horns. A good short stay place. Please note the brown building in the above picture. Do not know what is on top, but the bottom is the worst laundry facility I have ever seen. Out of order was most common thing. 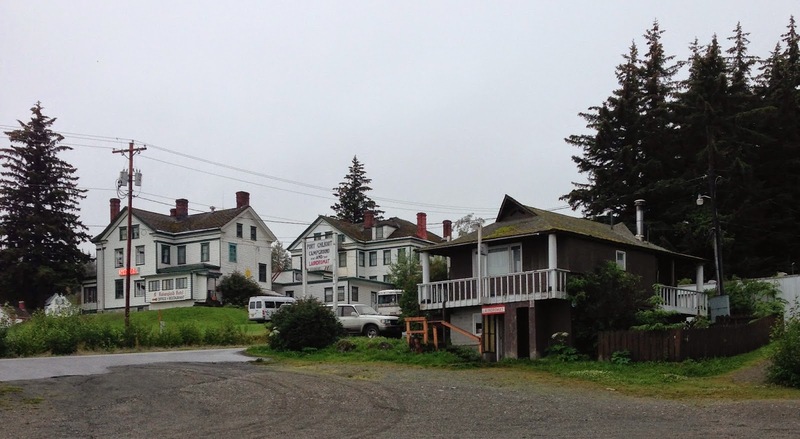 This and the campground is owned by the Hotel Halsingland, in Ft. Seward, shown in background. They have not put any money into this campground. Too bad. Tenters love this place… they can park their tents at many different tiers, lots of tents. The plus – its not far from town, fast ferry, fairgrounds, brew fest, and some good eateries. I worked on my new (as of April) e-spinner today. I had sold my well loved Majacraft spinning wheel last year, so that I could buy this Hansen Mini e-spinner. Much more doable size for living in a small spaces. But today was my first chance to actually spin on it. What a joy! This e-spinner has both electric as well as 12 volt ability, and I may look for a battery backup when I’m away from my rig. The wheel, manuals, cords, tools all fit in a shoebox, a boot box may be too big for all of it. And it has its own burlap tote bag. I’m in love with this. Didn’t think to take a picture when I had it out, but will for my next posting. There really is something special about the sounds and scents of the sea. Hope you are making progress with things. Progressing quite well, thank you. Already onto new adventures. Safe travels to you.